It was two weeks before Christmas when Carson Wentz scrambled right, turned up field and dived for the end zone, enduring a crunching tackle on his way to the goal line. The rest of the story since is well-told: Wentz tore the anterior cruciate ligament in his left knee and thrust the Philadelphia Eagles’ season into the hands of backup Nick Foles, at the time considered an NFL flameout. But all was not lost, reasoned Dave Peacock, of Reading, Pa. If Foles could lead the Eagles to a win over the Giants on Dec. 17, Philadelphia would secure a first-round bye in the playoffs. A win against the Oakland Raiders on Christmas Day would secure home-field advantage for a potential Super Bowl run. And Foles had spent 2 1/2 years as the Eagles’ starter and even led the team to the playoffs in 2013. “He’s better than half the starters in the NFL,” Peacock told co-workers. All was not lost with Wentz gone, Peacock thought. The city just needed a jolt of energy and optimism, and he knew just the thing. 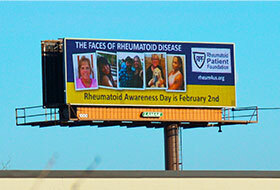 Lamar operates 75 digital billboards between Philadelphia and Reading. Foles, complete with Santa hat, has appeared on 30 of them. 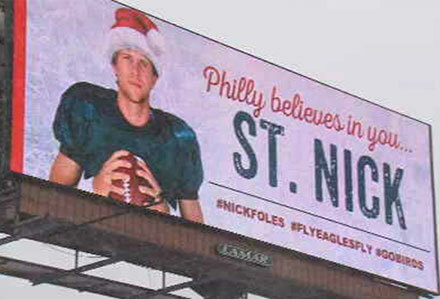 “I went to my artist and he put the Santa hat on Nick Foles and then it took on a life of its own,” Peacock said. To no one’s surprise, Philadelphians loved it, and Foles threw for 237 yards and four touchdowns against New York. After the Eagles knocked off the Raiders, too, Peacock pulled the message down. Eagles fans didn’t need to believe anymore. It happened. Now, they believe their birds could fly to a Super Bowl. 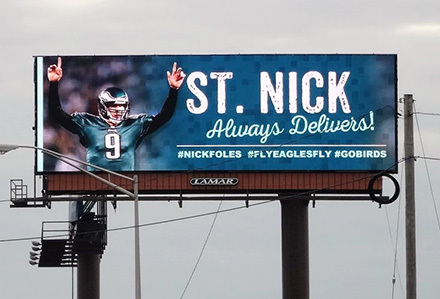 When Foles outdueled 2016 MVP Matt Ryan in the divisional round of the playoffs, Peacock returned the quarterback’s face to the billboards. Ahead of the NFC championship game against the Minnesota Vikings on Jan. 21, Peacock reconvened Lamar’s creative team. A win would send Philadelphia to the Super Bowl for the first time since 2005. Lamar’s team brainstormed ideas for a new billboard. Peacock said he plans to leave the sign up for the Super Bowl, in which New England is favored by five points. “The only thing that scares me — we need to make sure that everyone knows Tom Brady is the comeback kid,” he said. “If we get out in front, we gotta keep going.” So must the billboards. Peacock will need a new design for a potential Philadelphia victory parade. 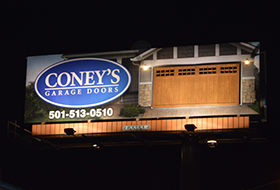 Conceived and executed by the Lamar Little Rock team, the billboard features illuminated sconces alongside the garage door to create an eye-catching, three-dimensional effect.